Out in the Pacific Ocean, there is a war taking place. It is a 'warm war,' a shoving match between the United States, since World War II the uncontested ruler of the seas, and China, which now possesses the world's largest navy. The Chinese regard the Pacific, and especially the South China Sea, as their ocean, and they're ready to defend it. Each day the heat between the two countries increases as the Chinese try to claim the South China Sea for their own, and the United States insists on asserting freedom of navigation. Throughout Southern Asia, countries such as Vietnam, Malaysia, the Philippines, Singapore, and South Korea respond with outrage as China turns coral reefs into manmade islands capable of supporting airstrips and then attempts to enforce twelve-mile-radius, shoot-down zones. The immediate danger is that the five trillion dollars in international trade that passes through the area will grind to a standstill. The ultimate danger is that the U.S. and China will be drawn into all-out war. 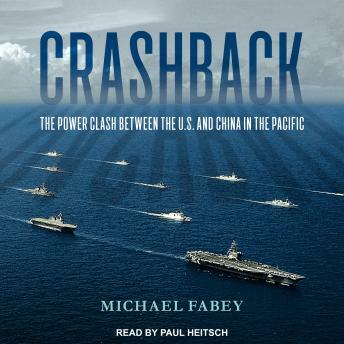 In Crashback, journalist Michael Fabey describes how every year the U.S. is 'losing sea.' He predicts the next great struggle between military superpowers will play out in the Pacific, and his book, more than any other, is an accurate preview of how that conflict might unfold.